"Spectre" special: Hollywood turns most movies into events these days, but the real thing always stands out from the crowd. That's certainly true of MGM, Columbia Pictures and Eon Productions'PG-13 rated action adventure spy thriller "Spectre," opening Nov. 6 at about 3,800 theatres. Directed by Sam Mendes ("Skyfall"), "Spectre" is what we really mean by "event" movie. It's the 24th episode in the official James Bond franchise from Albert R. Broccoli's Eon Productions that goes back over 50 years to 1962's "Dr. No." The franchise is older than many of the moviegoers who will be lining up to see it! "Spectre" stars Daniel Craig in his fourth outing as 007, Christoph Waltz as the villain Oberhauser, Ralph Fiennes as Bond's MI6 spy agency boss M (who at the end of "Skyfall" took over Judi Dench's role in the last seven episodes) and Monica Bellucci as a beauty who crosses paths with Bond in Italy. The long familiar MI6 characters of Q (Ben Whishaw) and Moneypenny (Naomie Harris) both return after having been reintroduced to the series in "Skyfall." Produced by Michael G. Wilson and Barbara Broccoli, its screenplay by John Logan ("Skyfall") and Neal Purvis ("Skyfall") &Robert Wade ("Skyfall") and Jez Butterworth ("Black Mass") is from a story by John Logan and Neal Purvis & Robert Wade. It was executive produced by Callum McDougall. Although "Spectre" doesn't open domestically until this weekend, it's already kicked off in very high style in the U.K. Its first day in theatres there was last Tuesday with ticket sales of $9.2 million (£6.3 million) at 647 locations. That put it in the record books as the best Tuesday in U.K. cinema history, beating the 2012 opening day business in British Pounds for the last Bond episode,"Skyfall." In U.S. dollars, it's different because of fluctuating currency exchange rates. "Skyfall's" £6.2 million converted at the time to just under $10 million. 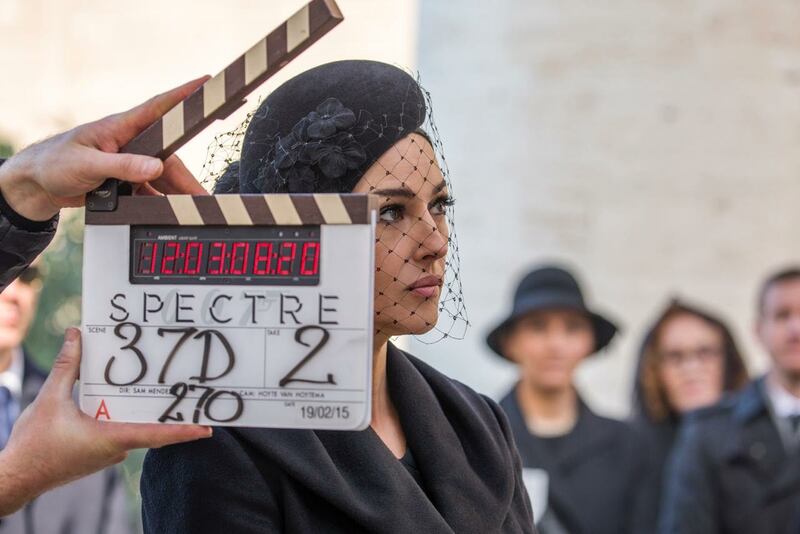 "Spectre's"£6.3 million converts at today's lower rate to about $9.2 million. The film's U.K. opening weekend was that country's biggest ever with £20.4 million vs. "Skyfall's" previous record setting £20.1 million. "Spectre's" first seven days in six international territories, brought in about $80.4 million. With such an auspicious kick-off, there are high hopes that 007 fans on this side of the Pond will also treat the new episode as a major moviegoing event. Bond is an iconic screen character that moviegoers around the world have grown up with and whose missions and romances they've followed as the actors playing007 in Eon's franchise changed over the decades – from Sean Connery to George Lazenby to Roger Moore to Timothy Dalton to Pierce Brosnan to Daniel Craig. In "Spectre,"a cryptic message from the past sends 007 on a rogue mission, first to Mexico City and then to Rome. In the Eternal City, he meets Lucia Sciarra (Bellucci), an infamous criminal's beautiful and forbidden widow. After infiltrating a secret meeting, Bond uncovers the existence of the sinister organization SPECTRE. Eon's first 23 Bond episodes have grossed $1.9 billion domestically. Unlike other franchises where the highest grossing episodes are often from early in the series' history, with Bond the biggest domestic successes are the most recent titles. In fact, the franchise's seven top grossing domestic episodes start in descending chronological order with "Skyfall," Daniel Craig's third turn as 007. After opening Nov. 9, 2012 to $88.4 million, it did $304.4 million domestically. The series' second ranking episode, "Quantum of Solace," opened Nov. 4, 2008 to $67.5 million and went on to gross $168.4 million domestically. It marked Craig's second performance as Bond. Third place goes to Craig's debut as Bond, "Casino Royale." It arrived Nov. 17, 2006 to $40.8 million and ended up with $167.4 million domestically. Fourth on the Bond list is "Die Another Day," which opened Nov. 22, 2002 to $47.1 million and did $160.9 million domestically. It marked Pierce Brosnan's fourth and final turn as 007. The fifth best grossing Bond episode, "The World is Not Enough," Brosnan's third assignment as Bond, opened Nov. 19, 1999 to $35.5 million. Its domestic cume was $126.9 million. Ranking sixth is "Tomorrow Never Dies," the second episode with Brosnan as 007, opened Dec. 19, 1997 to $25.1 million and did $125.3 million domestically. It's the only one of the top seven Bond episodes that didn't open in November. Seventh position goes to "GoldenEye," Brosnan's first appearance as Bond. It also marked Judi Dench's first of seven times playing M. "GoldenEye" opened Nov. 17, 1995 to $26.2 million and wound up doing $106.4 million domestically. What stands out is that it was only with the last episode, "Skyfall," that the long successful Bond franchise really moved into mega-blockbuster territory. "Skyfall's" $304.4 million domestic cume was $136 million more than "Quantum" had grossed four years earlier. While some of that increase stems fromticket price inflation, most of it represents the payoff from outstanding marketing by MGM, Columbia and Eon to build Bond into a major moviegoing event. "Spectre" will be looking to beat "Skyfall's" domestic record as well as its $1.1 billion worldwide box office cume – of which, $804.2 million came from international theatres – which made it the biggest Bond ever globally. In talking about what went into making Bond 24, Sam Mendes, a best directing Oscar winner in 2000 for "American Beauty," explains: "It all starts from character with me and I wanted to explore all sorts of different aspects of the characters that I'd left behind in 'Skyfall.' We had populated MI6 with a whole new generation of people — a new M, a new Money penny and a new Q. I wanted to let those relationships develop and grow." Their goal was to outdo what they had achieved with "Skyfall," observes Daniel Craig: "We wanted to be better than 'Skyfall.' It is as simple as that. We didn’t have a choice; we had to be bigger and better. With 'Skyfall' we set something in motion and we wanted to go a bit further with it and experiment a bit more." At the end of "Skyfall," Bond was rejuvenated and there was "a sense of new beginnings," Mendes notes. That impacted significantly on "Spectre" where Bond is now an entirely proactive character controlling his own destiny. "'Skyfall' was an entirely reactive movie as far as Bond was concerned," Mendes says. "In the first sequence, he was pursuing somebody with all his old focus and drive, but he gets shot before the credits even roll and for the rest of the movie he is one step behind Javier Bardem's character, Silva. "You could even argue that at the end of 'Skyfall' he has failed. He has not kept M alive, and though Silva's death is a victory for Bond, there are other elements that are failures. Hence, with "Spectre,"I wanted to give him a chance of redemption." Barbara Broccoli agrees: "I think this film is very much about the empowerment of Bond and with Daniel portraying the character, he does this with such enormous integrity that we really feel what he is going through, emotionally as well as physically." The infamous organisation SPECTRE played a key role in six earlier Bond epics — "Dr No,""From Russia With Love,""Thunderball,""You Only Live Twice,""On Her Majesty's Secret Service" and "Diamonds Are Forever"— but in"Spectre"
the organisation was reimagined for the 21st Century. "What we've got here is a kind of creation myth at play," Mendes points out. "We are not adhering to any previous version of the SPECTRE story. We are creating our own version. Our film is a way of rediscovering SPECTRE and the super villain, setting him up again for the next generation." As Bond learns more about SPECTRE, he also finds himself having to contend with problems closer to home. In London, Max Denbigh (Andrew Scott), codename C, has been appointed head of the Centre for National Security, and is challenging the relevance of MI6. "There's a school of thought in the movie that says when it comes to national security, everything should be centralised, that we should be almost entirely dependent on surveillance and should let drones do our dirty work abroad," says Mendes. "C questions whether we need to send people out into the field. MI6 is, therefore, at risk; in particular the Double-0 section." With "Spectre," the filmmakers say they moved a bit closer to the way the Bond films once were. "We could work with a slightly different style from the other Bond films I've done," Craig notes. "This film is very individual, but also harks back a little to what has gone before in the Bond films of the '60s and '70s." The new movie recalls the classic Bond films in terms of its cars, tone, lighting and even the cut of 007's suits, according to Mendes: "I wanted to get back to some of that old-school glamour that you get from those fantastic, other worldly locations. I wanted to push it to extremes." The filmmakers also did a major shift in "Spectre's" physical environment, going from hot weather to cold. They returned to snow for the first time since 2002's"Die Another Day." 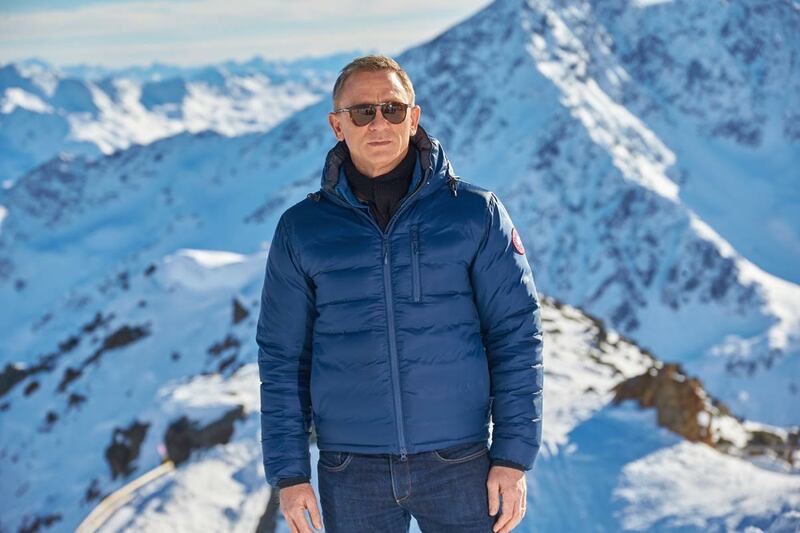 Bond's six previous adventures with snowbound landscapes were: "On Her Majesty's Secret Service,""The Spy Who Loved Me,""A View To A Kill,""The Living Daylights,""The World Is Not Enough"and "Die Another Day." "We were very conscious of what we've done in all these films," Michael Wilson says. "That meant we wanted to do something different from being in bobsleighs or using any of the usual winter sports. Hence, we had a different kind of chase, with aeroplanes and 4x4s." Of course, no Bond movie would really be complete without some scenes set in London. "The challenge was to try and find a way of shooting London that felt fresh and new and yet which was also a continuation of 'Skyfall,'" Mendes adds. "We tried to find a way to look at familiar locations and familiar places within London from a different perspective and I think we found some great ways to do that." Bottom line: Working to Bond's benefit is that October ended on a quiet box office note with Halloween falling on a Saturday for the first time in six years. Trick-or-treating and partying took their toll on ticket sales. 20th Century Fox and Scott Free Productions' "The Martian" held on to first place for a second consecutive weekend –plus two earlier chart topping weekends -- with $11.4 million. Its cume after five weeks is $182.8 million. So "Spectre" is arriving without any big hold over competition. It should also benefit from having great playability to adult men and additional appeal to adult women. The weekend's only other wide opening is20th Century Fox and Blue Sky Studios G rated 3D animated comedy adventure "The Peanuts Movie" at about 3,600 theatres. It's targeted to families and is perfect counter-programming to Bond.